This is a case study of a criminal prosecution and sentencing for a serious environmental crime in the District Court of Queensland. 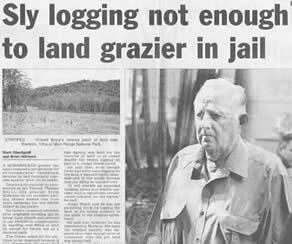 In 2001 a grazier, Vincent Thomas Boyle, cleared a large swathe through the Main Range National Park in South East Queensland. The National Park forms part of the Central Eastern Rainforest Reserves Australia (CERRA) World Heritage Area. The cleared area separated two of the grazier’s properties and the clearing allowed his cattle to move between the properties and increased the size of his pasture. The grazier was prosecuted on indictment for taking a natural resource in a protected area in contravention of section 62 of the Nature Conservation Act 1992 (Qld), an offence with a maximum sentence of $225,000 or 2 years imprisonment for an individual. The grazier pleaded guilty, which meant that there was no trial before a jury and the case proceeded directly to sentencing for the offence. As the prosecution was on indictment the sentencing occurred in the District Court of Queensland. The few previous prosecutions for serious environmental crimes established imprisonment as being a real possibility in Boyle’s case despite his plea of guilty, that he was 76 years of age, and had no criminal history. Rehabilitation of the cleared land was practically impossible and estimated to cost $410,000. To avoid jail Boyle “volunteered” to donate 480 hectares of other forested land owned by him to the Main Range National Park. Given the significant conservation values of this land the EPA accepted his offer and agreed to not press for imprisonment. The agreement did not exchange the 13 hectares of cleared land, which remained in the National Park and CERRA World Heritage Area. The sentencing judge, Hoath DCJ, made it clear that based on R v Dempsey imprisonment would have been imposed except for the fact that the grazier was in the unique position of having land of high conservation value to offer as compensation to the National Park. Boyle was first sentenced in December 2004. He was fined $10,000 and ordered to pay compensation amounting to $410,000 with specific provision to allow him to pay this by a transfer of 480 hectares of his land to the Queensland Government for inclusion in the National Park. Only days after the original sentence was imposed the EPA learnt that logging was occurring on the land offered in compensation. EPA officers investigated and found around 250 logs had been removed, old timber tracks had been re-opened and damage had been caused to parts of the land in removing the timber. The transfer of the land was proposed to occur in March 2005 so at the time of the logging it was owned by Boyle and no approval was required for the forestry operations. No offence had therefore technically been committed by the logging but it was clearly contrary to the spirit of the agreed land-swap. To halt the logging the Minister for the Environment took the rare step of issuing a conservation order under the Nature Conservation Act 1992 (Qld). The EPA then sought to re-open the sentencing of Boyle on the basis that the sentence had been decided on a clear factual error of substance (namely that the land offered in compensation was substantially pristine). At the second sentence hearing Hoath DCJ re-sentenced Boyle to pay a $50,000 fine, plus compensation of $410,000 with provision allowing this to be paid by transfer of the 480 hectares to the Queensland Government. A conviction was recorded. While the offer of a land-swap as compensation for illegal clearing is novel, the real significance of the case is that it illustrates how Queensland courts increasingly consider heavy penalties appropriate for serious environmental offences. When estimated legal fees of $10,000 are added, the offence will have cost in the order of half-a-million dollars. This is a significant deterrent. Location map of site where clearing occurred. Satellite image showing location of clearing. Photographs of clearing taken by EPA. Sentencing remarks at first sentence hearing by Hoath DCJ of the District Court of Queensland on 17 December 2004. 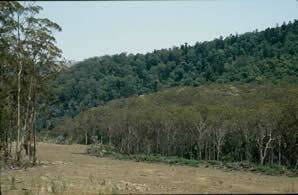 Photograph of cleared land courtesy of EPA.